SS Nemanja under her previous name of Trojan Prince. The steamship Nemanja was built in 1918 as the War Perch by Bertram and Sons of Sunderland, England. 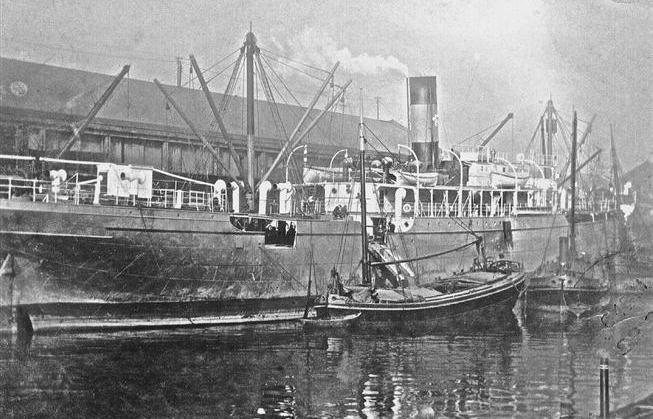 Ordered by the UK Shipping Controller for WWI, she had a colorful 24-year career with four names, including Trojan Prince for the Prince Line (Furness Withy and Co.) between 1919 and 1924, then Hoosac for the White Diamond / Warren Line Ltd. (same parent firm) until 1926 when the Atlanska Plovidba Ivo Racic firm of Dubrovnik purchased her. Her final owners were the Jugoslavenski Lloyd Akcionarsko Drustvo firm of Zagreb (Uboat.net, Wrecksite.eu). The ship was a WWI B-class steam cargo vessel, 5,226 gross tons, 412’ long, 52.2 feet wide and 28.5 feet deep. Her 517 net horsepower engine turned a single screw which propelled the ship at 11 knots when built. Between mid-1941 and 1942 the ship participated in half a dozen convoys which took her from Liverpool to Halifax several times and to West Africa at others (convoyweb.org.uk). On her final voyage the Nemanja was under the command of Captain Karlo Loser supported by Chief Officer Jacob Mardesic, both Yugoslavian. There were at least four British citizens on board; two Defensively Armed Merchant Ships (DEMS) gunners named Benjamin Parry (age 21, Royal Navy) and 24-year-old Sidney John Lawrence (Royal Navy) to man the three-inch gun aft, as well as British Army Gunner Anthony Connor (age 27) and 21-year-old Galley Boy Sidney Evans. There was a total of 47 men aboard for the voyage from San Pedro de Macoris in the Dominican Republic to Halifax. The cargo was 7,207 tons of sugar in bulk. Nemanja left the DR on the 30th of March, 1942 bound north for Halifax. Her charterers were the British Ministry of War Transport (MoWT). Just over a week later, at 10:25 PM local time on April 7th, Nemanja was 250 miles south of Halifax and east of Nantucket, and 190 miles from Cape Sable, Nova Scotia. She was only 30 hours from her destination at 8.5 knots, and was zig-zagging around a base course of 25 degrees north-northeast. No lights were showing, and though the wind was between 15 and 20 knots, there was a rough sea running and the night was very dark. Captain Loser was taking no chances (there had been rampant sinking of Allied ships by German U-boats that winter and spring), and he posted five lookouts: one aft by the gun platform, three in the bridge, and an extra lookout between the two beside the engine room. The German U-boat U-84 under Oberleutnant zur See Horst Uphoff had been trailing Nemanja for roughly ten hours, and at 2:57 AM on the 8th of April (about 8 PM local, or ship’s time) had fired a pair of torpedoes at the ship. Both missed, but were undetected by the Allied lookouts. So Uphoff maneuvered ahead to take more shots. Two hours later, at 10:25 PM ship’s time, U-84 fired another torpedo which caused a significant explosion on the starboard side of the Nemanja between the third cargo hold and another hold containing bunker coal. Unfortunately for Captain Loser and his men, the impact caused the radio aerials to collapse along with one of the masts, meaning that a distress signal could not be sent, though efforts were made to send them. Worse yet, the ship’s steering was disabled. The gunners could not make a bead on the enemy as U-84 remained out of sight in the darkness. With the ship sinking 34 of her complement launched and boarded a lifeboat which was damaged. Neither the captain nor the chief officer were able to board in time, or to launch the other lifeboat or rafts, so far as is known. Thirteen out of 47 men were never seen again. Those men who were getting away in the lifeboat did see U-84 in the distance. Unbeknownst to them, Uphoff sent a fourth torpedo towards his prey, and the coup-de-grace struck Nemanja, sending her to the bottom, 14,000 feet away. Whether for good measure or not, U-84 was seen to fire a shell at the doomed ship from a quarter of a mile away. Uphoff did not interact with the survivors, but rather motored off into the choppy seas. After roughly a day and a half in the hostile cold waters off Canada in early April, the 34 men in the crowded and damaged boat were discovered by the British tanker Franche Comte, which picked them up at 10 AM on the 9th of April. 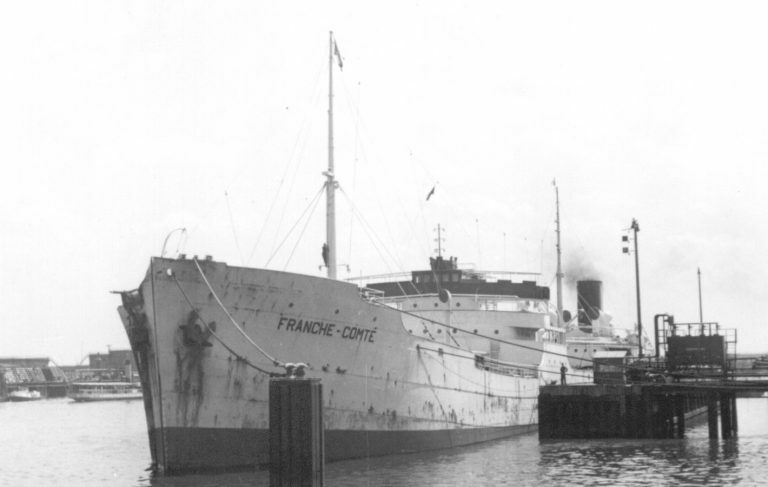 The Franche Comte participated in over 30 convoys in World War II, and was on its way to join Convoy HX.185 in Halifax, which was due to depart for Liverpool on the 14th of April 1942. She was a 9,314-ton tanker built in 1936 (convoyweb.org.uk). The men on the British ship took care of the 34 men for two days before disembarking them in Halifax, where they arrived on the morning of the 11th April. News of their arrival was transmitted to, and then by, the US Navy at 12:55 local time that day. British tanker Franche Comte, which rescued 34 survivors of the Yugoslav Nemanja off Canada on the 9th of April and took care of them for two days.